At JoJo, we have always worked under the ethos of “waste not, want not” with the aim of preserving our planet for our children and theirs. In the early days of the company, recycling and free-cycling were needed across the business to maximize capital as a start-up; our Founder and MD still cycles to most meetings instead of driving and we use low-energy lighting in our stores. Over the years, our initiatives have become a little more sophisticated each time – we switched from air to sea freight to reduce our carbon footprint, have a gardening club in our London office to encourage sustainability, and now we’re taking a greener approach to fashion, first with the launch of our polarfleece collection made from recycled bottles, and now we are so excited to announce that our rainwear styles are made with recycled clothing! Not only is our Pack-Away Rainwear perfect for spring showers thanks to the 100% waterproof fabric with taped seams, it’s perfect for the planet too! This collection has been made from recycled clothing which could otherwise have been sent to landfill. If those aren’t reasons enough to love these products, they’re also made with breathable fabric for extra comfort and pack away into their own integral bag that makes them easy to take on every outdoor adventure. Right now, there’s 20% off rainwear for a limited time only, don’t miss out! 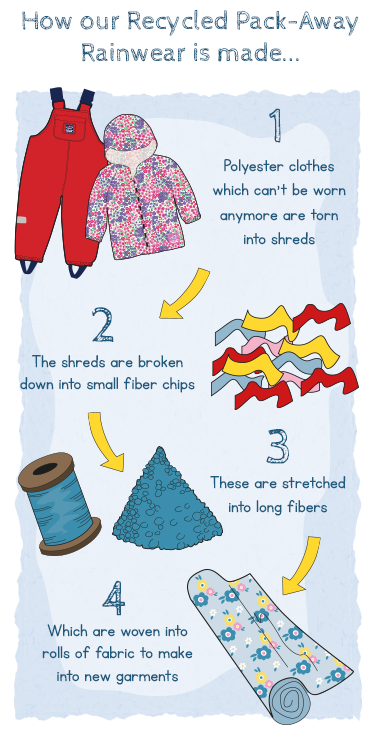 Our first venture into the recycled clothing business was the JoJo Recycled Polarfleece. Made from plastic bottles, these garments help to reduce the amount of waste as well as harmful emissions deposited into the atmosphere. Super soft and cozy, our polarfleece styles have proven to be a hit and have been bestsellers for as long as we can remember! We may be retailers, but we have no wish for you to purchase items just because your little one’s favorite cardigan has lost a button or their tee has a tiny hole. We feel it is a huge waste to throw items away just because they require a little TLC, so we launched our Make do and Mend page, where we have listed some of the easiest repair jobs with step by step instructions. Our From a Mother to Another campaign was set up to help vulnerable families in the UK and Ireland and Syrian refugees living in Lebanon. We encourage our customers to donate any outgrown or unused clothes to help reduce the amount of clothing waste going to landfill whilst helping those in humanitarian need in a practical manner. The campaign begins a few weeks before Mother’s Day; our customers bring their clothes into their local JoJo store, they’re sent to our warehouse in Newport where we pack them into lovely gift parcels and send them to the charities we are working with to distribute them to families in crisis. In 2018, we sent over 4000 packs of clothes, each containing 3 outfits, to charities in the UK and overseas. Our Newport Sale Store is the only JoJo clearance outlet. With new stock arriving daily, there are always bargains aplenty on samples, seconds and end of lines. Our store team will do their best to point out any faults as items are sold as seen and may not always be perfect, but we are much happier selling them at a reduced price than simply throwing them away. Our mission is to offer high quality products at reasonable prices – quality is a top priority as we do encourage our customers to pass down our clothes to younger siblings, friends or family. 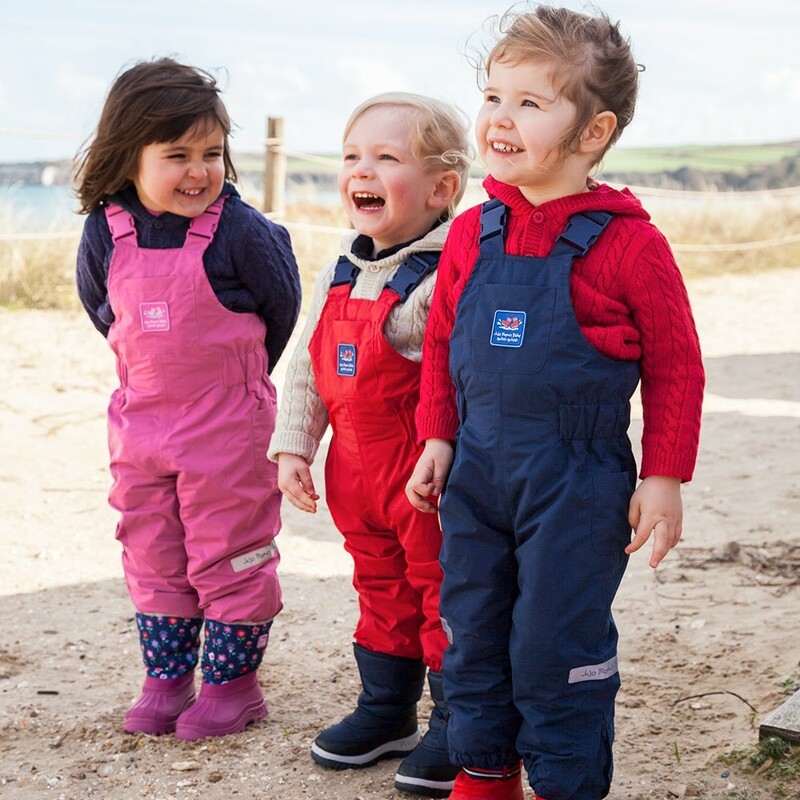 JoJo clothes are made to last; many of our winter styles are made from hardwearing cotton cord and our children’s pants feature elastic waists to ensure a good fit as they grow. Many of our maternity styles can be worn after the birth too, with many including practical nursing features so you can get even more wear out of them if you decide to nurse your child.